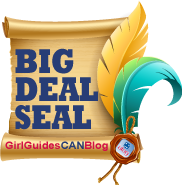 Update: This post was voted as a 2011/2012 GirlGuidesCANblog Big Deal Seal winner in the Growing Guiding category! Bravo blogger Karen! Several months ago I put a post up on my personal blog about becoming a Guider. The GirlGuidesCAN blog picked it up and after a short series of emails back and forth, I was asked to be a guest blogger, blogging about being a first-time Guider. This is my fourth post (and very late!) in a series of posts about my first year in Guiding. Don’t forget to read my earlier posts: First Impressions, My First Unit Meeting, and Girl Guide Cookies. Crap. She found me. I thought my stunned virtual silence would make her think I’d moved away or migrated south or had broken all my fingers and was unable to type. Better write back and admit that I knew I missed my deadline of January 1. Here goes. Phew. Maybe that will buy me some time. Fact is that my life is dominated by Guiding right now – insanely so. But of course, I also have three kids – 7, 5 and 1 – who like their share of my time as well – not to mention parent council and church obligations. And apparently I have a husband around here somewhere. Likely buried under the constantly-ignored mess. In other words, I’m feeling pulled in all directions. And it’s totally my own fault. I have trouble saying no. Ooh, email from Talya…. Which brings us to today… February 10, 2012 and here I am writing up my post because (typically) I’ve put it off until the last second. Again. I blame it on my new addiction to Words with Friends. It makes me wonder if I’m an over-achieving procrastinator. Let’s back up to a week or so ago to take a look at my life last week. Ready? Be forewarned though… this is not for the faint of heart (or for those with little time). Just back from an amazing training day (“January Thaw”) put on by our Ottawa Guiding Community. Loved it. Favourite parts were the sessions on dancing and the other one on games. Also, loved gleaning ideas from other Guiders: must book sleepover at Nepean Museum in future. Also, get Inuit throat singers to come to Sparks. Loved January Thaw but meant John had to work all day today to catch up after getting nothing done yesterday but changing diapers and playing in snow (sounds awesome to me… minus the diapers). Today was all about the kiddies: we played outside, baked, played board games and, okay, I did some planning for Brownies. Sent girls off to school and then started the Safe Guide paperwork for our Sparks sleepover on Friday while ignoring Henry. Yeah, yeah, DCFTBP, I know, it’s really late. But we just decided to join in on the sleepover so I missed the deadline. It’ll be fine. It will be fine, right? Crap. I better email Sara. She’ll put me at ease. And Sheila. Sheila knows everything. She’ll tell me it will be fine. Okay, so possibly it won’t be fine based on the slight tone of panic I inferred from the emails I got back. Double crap. Okay, submitted forms and begged for forgiveness, pleaded stupidity and oozed desperation. That was Sheila’s advice (not the stupidity part, that was my own idea). Okay, onto Brownie stuff. Have to write intro letter to new Brownie starting today. Thank the stars that Lynn (Resource Guider Extraordinaire) is coming to dance with the Brownies today so I don’t have to do much planning. Sparks tonight! Must get all forms ready to give parents for sleepover without giving off impression that I don’t technically have permission to take all these girls to a sleepover (trying not to think about it every waking moment) but first Kindermusik, then skating with school, then piano tuning. Thankful (again!) for Lynn coming to dance with the Sparks! Ooh… have to get badges ready to hand out, too. CRAP! Just got email telling me that “the Safe Guide Database is down and my Safe Guide case won’t be assessed for 10 to 14 days.” PANIC ENSUES. Call phone number in email. Leave message. Desperate message. Please, please help me. Many Sparks counting on me. Bake pie as therapy. PHEW. Thank you Jennifer, whoever you are. Just got call telling me that they were aware of my SG case and they’re getting it assessed but I should expect the assessor to give me a virtual slap on the wrist when I get my assessment back about the lateness of my forms. I’ll take that for the team if it means my Sparks get to go on their sleepover. And I get to sleep on a concrete floor under giant play structures while Sparks and Brownies keep me awake. Wait a second….. Drink tea. Lots of tea. CANPAR box arrives – many badges, new fleece for me. Start sorting badges. Start preparing future Safe Guide forms for Brownie visit to Parliament Hill. Not setting myself up for this kind of panic again. Is this week over yet? Holey Moley. Head to MEC to pick up Therm-a-rests for Hope and me. I’m not sleeping on the concrete floor at Cosmic Adventures without something between my sleeping bag and the floor. My almost-40-year-old hips are not willing. Get email with approval for sleepover!!! Monster sigh of relief. And no slap on the wrist. Everything is coming up Karen! Sweet. Started the day with a chiropractic adjustment. Must be in prime condition for tonight’s sleepover. Tidy, play, glass of wine. Necessary to get ready for tonight. Pack. Nurse Henry so I don’t end up leaking through my Guiding shirt. Head to Cosmic Adventure with a Spark who doesn’t stop talking the entire drive there. Excited much? Had a great time. Actually got some sleep. Drank lots of coffee. Had great chats with fellow Brownie and Sparks Guiders from our area. I think this is one of the major benefits of doing these events as a group. Head home. Drink coffee. Week done. So that was my week. I realized something very important in noting down my Guiding activities for a week: I’m doing too much and by the end of the week of noting it all down, I was actually feeling resentful, which caught me by surprise. I don’t want to feel resentful. I really and truly love Guiding but two Units is a lot. This exercise also made me realize that I don’t delegate enough and so I ended the week with a message to Julie, the other Owl, asking her to take on all the arrangements for cookie blitzes because I honestly couldn’t fathom working on that this week. And I’m going to do the same with one of the other Sparks Guiders. But it can’t end there. I have to start saying no to things, and not just Guiding things. I also have to pass more of the meeting planning over to Crystal Owl. I’m supposed to be going back to work in September and I can’t fathom keeping up this amount of involvement and working full-time. It just won’t work. When I started as a Guider in September, another Owl (Kathy) said to me that she could easily spend four hours a day on Guiding. At the time, I wondered how that was possible. I totally get it now. On average, yeah, I could probably spend that amount of time on it between the two units, and it could be more if we had a big Brownie group, which thankfully we don’t. What Talya said in her email is right: it is a love/hate thing. I love Guiding. I won’t be quitting. I get so much joy out of it. I look forward to our meetings and events and the training and getting together with other Guiders. But I also hate how much time it takes some weeks. And I wonder how I’ll be able to do it next year. So, what do we do? How do we ensure we don’t resent it, still love it, not hate it (too much), and do better at delegating and getting more Guiders? And also, how do I deal with my affliction of an over-achieving procrastinator and, perhaps more importantly, with my verbal (or written) diarrhea? 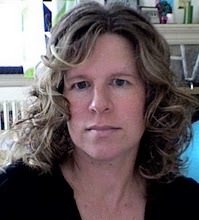 By guest blogger and Guider Karen. Karen will be offering her thoughts on being a new Guider with Girl Guides over the next few months. Read more from Karen on her personal blog Virtually There. This entry was posted in Girls' Guides and tagged new guider. Bookmark the permalink. As a guider who has done this for years and several units at a time with several other hats I can relate and I can also tell you it gets easier. A great team is first thing. If you have people you can count on that will help. Also once you have done the same level for several years you can start recycling. every game I make I laminate and file away and the next time it is much easier. I don’t believe in doing things twice and once you start recycling you just add new exciting things you find. The Guiding year is set up with hugely busy times and then quieter. If you can start to plan your year further ahead…which gets easier with time it help tremendously. It sounds like you are doing great. Keep it up. “Only One Hour a Week!” …. Great, accurate, hilarious post! 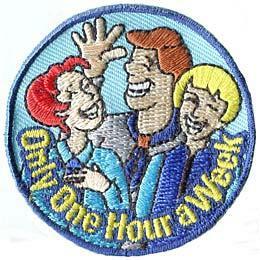 I want one of those “only one hour” badges linked above!!!! Great post! I’ve been doing Guiding for double digit number of years now and I still wonder about the same things. I was a SAHM/part time worker most of the time. This is my first year as a full time employee and Guider of 2 units. It’s tough and I do sometimes resent it. But then something goes right and I’m appreciate my choice to continue as a guider. It is indeed imperative to delegate and sometimes just let things go. Thank you for writing this blog. It helps when new guiders realize that they really aren’t the only ones to feel this way. Great post. I have quite often thought life would be so much easier if I quit but I haven’t in 10+ years of being a leader so I must enjoy it enough to stick around. I have only run two units once and it was out of necessity to keep them open and it was one of the most stressful Guiding time ever. I admire anyone who does it long term AND with different sections.